The Inland Slope Rebels used to host a PSS Festival at Cajon Summit every Memorial Day weekend and it attracted PSS enthusiasts from around the world. The Intermountain Silent Flyers also hosted a popular slope soaring event called Soar Utah every year, and having two such events each year forced many of the participants to choose one or the other due to economic or time off reasons. So a few years ago the clubs agreed to hold their events on alternating years, and that’s how they’re scheduled now. 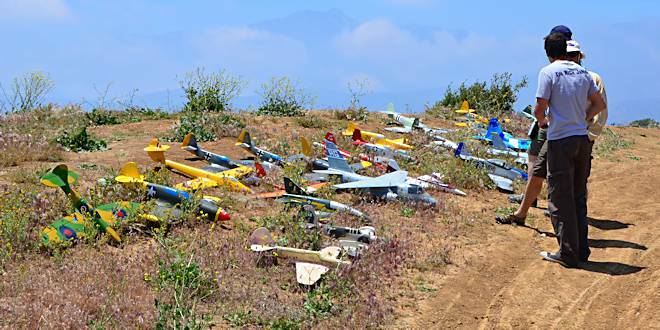 But that left a big void in the Southern California PSS schedule every other Spring, so the locals who prefer to stay close to home continued to get together at Cajon Summit for some informal flying on “Soar Utah” years, and they call it Fake Fest. So what does PSS stand for? It’s an acronym for Power Slope Scale or Power Scale Slope (depending on who you ask) and the planes are gliders which are modeled after actual full-scale powered production aircraft. Most are warbirds, but general aviation and commercial aircraft are also popular. This coming Memorial Day weekend is Soar Utah’s turn to be the “official” event so it’s Fake Fest time here in Southern California. The informalities actually begin on Thursday May 22nd at Point Fermin where some of the group gets together for some coastal flying. Then they’re off to Cajon Summit on Friday, Saturday, and Sunday and there’s usually an eating meeting at a local restaurant on Friday and Saturday nights. Because Fake Fest is an informal event with no signups or awards, there are also no rules about what you can fly like there are during a PSS Festival. In other words, you can fly just about anything you bring as long as you follow a few basic rules. For example, composite warbirds and foam combat wings don’t play well together, so groups of pilots take turns flying planes with similar speeds and flight characteristics. 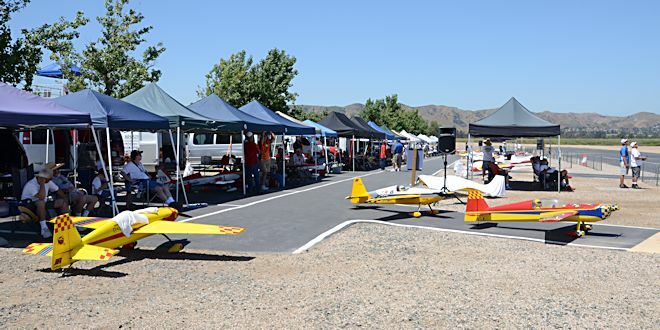 The Pomona Valley Model Aircraft Club is hosting their annual IMAC and Freestyle Challenge at Prado Airpark on May 23rd – 25th. This event consists of top-notch pilots flying precision aerobatic routines with giant scale RC aircraft in a competition environment. Prado Airpark is a first-class facility and the PVMAC members are wonderful hosts. There is food and beverages available there and several equipment manufacturers and vendors show up to exhibit and sell their products. 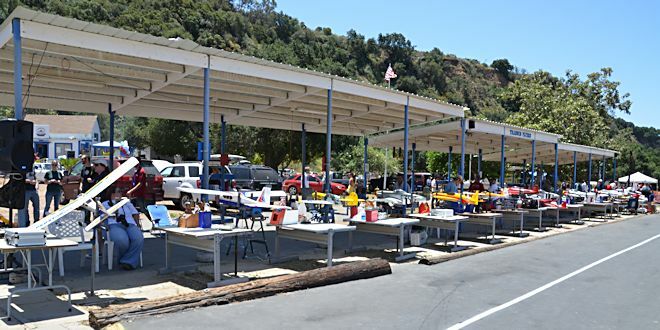 Nestled away in Trabuco Canyon is the home field of the Trabuco Flyers, and each Memorial Day Weekend they host a fun fly and pig roast. I went on a whim a couple years ago and had such a good time (as a spectator) that it’s now on my annual must-do list. The event starts on Saturday May 24th and ends on Sunday the 25th. Saturday is Fun Fly day and the activities include getting the pig in the ground, a pot-luck dinner, and a night flying. 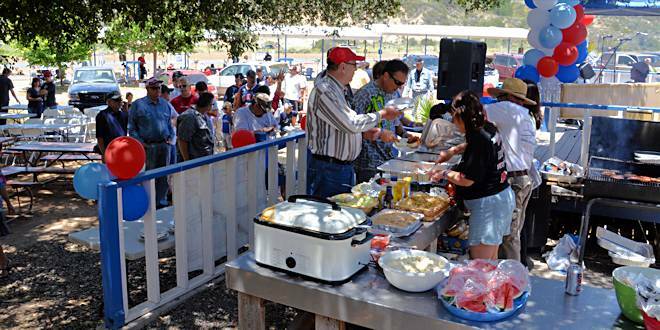 Sunday’s activities include more fun flying, aerobatic performances by some of Southern California’s best RC plane and helicopter pilots, live music, a raffle with lots of great prizes, and at lunch time they dig the pig out of the ground, carve it, and serve it up with lots of other mouth-watering vittles. So what will PGR do? I’m going to try to spend Saturday morning at the IMAC and Freestyle Challenge and try to spend Saturday afternoon at Fake Fest, but I’m definitely going to spend Sunday at the Pig Roast and Fun Fly. That’s a given!